17th Birthday Holographic Flag Bunting Decorate a special 17th Birthday with this holographic flag bunting, the bunting measures 8M long. Each flag is decorated with a coloured background featuring stars and a big number seventeen. Delivery. 2nd Birthday Holographic Flag Bunting Decorate a special 2nd Birthday with this holographic flag bunting, the bunting measures 8M long. Each flag is decorated with a coloured background featuring stars and a big number two. Delivery. Giant Multi Coloured Paper Flag Bunting This giant bunting is decorated with bright multi coloured flags, the bunting measures 10m long. Perfect to add your finishing touch to any special event! Delivery. 1st Birthday Holographic Flag Bunting Decorate a special 1st Birthday with this holographic flag bunting, the bunting measures 8M long. Each flag is decorated with a coloured background featuring stars and a big number one. Delivery. 40th Birthday Holographic Flag Bunting Decorate a special 40th Birthday with this holographic flag bunting, the bunting measures 8M long. Each flag is decorated with a coloured background featuring stars and a big number forty. Delivery. Coloured Paper Flag Bunting A fun colourful paper flag bunting, perfect for any occasion. The bunting measures 10m long featuring 48 multi coloured paper flags which measure 23cm x 12cm each. Delivery. 11th Birthday Holographic Flag Bunting Decorate a special 11th Birthday with this holographic flag bunting, the bunting measures 8M long. Each flag is decorated with a coloured background featuring stars and a big number eleven. Delivery. 6th Birthday Holographic Flag Bunting Decorate a special 6th Birthday with this holographic flag bunting, the bunting measures 8M long. Each flag is decorated with a coloured background featuring stars and a big number six. Delivery. Blue holographic banner. With our experiences of Baby Showers, Children's Parties and Weddings, we aim to provide products to cater to your special events. About House Of Party. 7th Birthday Holographic Flag Bunting Decorate a special 7th Birthday with this holographic flag bunting, the bunting measures 8M long. Each flag is decorated with a coloured background featuring stars and a big number seven. Delivery. 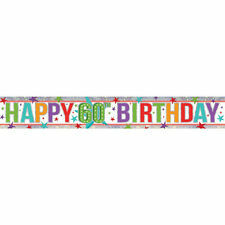 ---Includes 1 pennant banner ---Approximately 10m in length ---Features a spectacular of bright yellow coloured plastic pennants approximately 30cm x 46cm in size ---Perfect for any occasion. 14th Birthday Holographic Flag Bunting Decorate a special 14th Birthday with this holographic flag bunting, the bunting measures 8M long. Each flag is decorated with a coloured background featuring stars and a big number fourteen. Delivery. 15th Birthday Holographic Flag Bunting Decorate a special 15th Birthday with this holographic flag bunting, the bunting measures 8M long. Each flag is decorated with a coloured background featuring stars and a big number fifteen. Delivery. 70th Birthday Holographic Flag Bunting Decorate a special 70th Birthday with this holographic flag bunting, the bunting measures 8M long. Each flag is decorated with a coloured background featuring stars and a big number seventy. Delivery. 10th Birthday Holographic Flag Bunting Decorate a special 10th Birthday with this holographic flag bunting, the bunting measures 8M long. Each flag is decorated with a coloured background featuring stars and a big number ten. Delivery. 3rd Birthday Holographic Flag Bunting Decorate a special 3rd Birthday with this holographic flag bunting, the bunting measures 8M long. Each flag is decorated with a coloured background featuring stars and a big number three. Delivery. 12th Birthday Holographic Flag Bunting Decorate a special 12th Birthday with this holographic flag bunting, the bunting measures 8M long. Each flag is decorated with a coloured background featuring stars and a big number twelve. Delivery. 9th Birthday Holographic Flag Bunting Decorate a special 9th Birthday with this holographic flag bunting, the bunting measures 8M long. Each flag is decorated with a coloured background featuring stars and a big number nine. Delivery. 21st Birthday Holographic Flag Bunting Decorate a special 21st Birthday with this holographic flag bunting, the bunting measures 8M long. Each flag is decorated with a coloured background featuring stars and a big number twenty one. Delivery. 60th Birthday Holographic Flag Bunting Decorate a special 60th Birthday with this holographic flag bunting, the bunting measures 8M long. Each flag is decorated with a coloured background featuring stars and a big number sixty. Delivery. 30th Birthday Holographic Flag Bunting Decorate a special 30th Birthday with this holographic flag bunting, the bunting measures 8M long. Each flag is decorated with a coloured background featuring stars and a big number thirty. Delivery. 50th Birthday Holographic Flag Bunting Decorate a special 50th Birthday with this holographic flag bunting, the bunting measures 8M long. Each flag is decorated with a coloured background featuring stars and a big number fifty. Delivery. Total Length: 2.5m (8ft). KW1-KW17, PA20-PA38, PA41-PA49, PA60-PA78, PH4-PH44, PH49-PH50, PO (Isle Of Wight) TR (Isles Of Scilly) ZE (Channel Isles). AB31-AB38, AB40-AB56, BT (Northern Ireland) GY, HS, IM (Isle Of Man) IV1-IV28, IV30-IV32, IV36-IV49, IV51-IV56, IV63, KA27-KA28. Party Holographic Flag Bunting Decorate a special party with this multi coloured holographic flag bunting, the bunting measures 8m long. 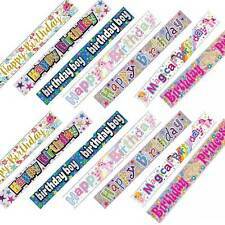 Each flag is decorated with a coloured background featuring stars and the words 'Party'. Delivery. Foil Banner. Contents :- 1 x foil Banner. 4th Birthday Holographic Flag Bunting Decorate a special 4th Birthday with this holographic flag bunting, the bunting measures 8M long. Each flag is decorated with a coloured background featuring stars and a big number four. Delivery.